7 VICTORIA TERRACE, EDINBURGH, EH1 2JLPublic meeting with Dave Webb (Chair of CND) who will be speaking with Tim Coles (author). This event is organised by Edinburgh CND and Edinburgh Stop the War. Book your free place now via Eventbrite! Dave Webb has been chair of CND since 2010 and has played a leading role in CND’s work on missile defence. He is the convenor of the Global Network Against Weapons and Nuclear Power in Space and a member of Scientists for Global Responsibility. 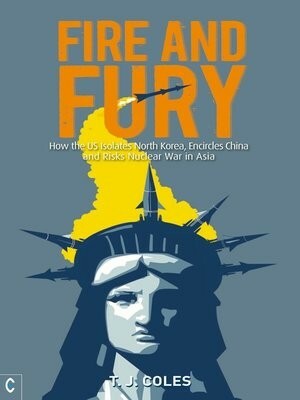 Tim Coles is the author of “Fire and Fury: How the US Isolates North Korea, Encircles China and Risks Nuclear War in Asia”. He is a founder and director of the Plymouth Institute for Peace Research and in the past two years has written a series of timely books about geopolitical and economic matters. Dave will be just back from the Preparatory Committee for the 2020 Review Conference of the Parties to the Treaty on the Non-Proliferation of Nuclear Weapons (NPT) is scheduled to hold its second session from 23 April to 4 May 2018 at the United Nations Office in Geneva. This will be the second of three planned sessions that will be held prior to the 2020 Review Conference. So, on Monday, representatives from almost all states, including the UK, will meet in Geneva to discuss the future of the treaty. In 2018 we mark the 50th anniversary of the NPT, a milestone in global attempts to get rid of nuclear weapons. Kate Hudson will also be travelling to Geneva. This is a chance to directly challenge the UK government to disarm its nuclear weapons. Along with Parliamentary CND Chair Caroline Lucas MP and other senior politicians, she’ll be demanding to see concrete plans from the government for disarming the UK’s nuclear weapons. A motion has been put forward in the Westminster Parliament which calls on the UK Government to inject new life into the NPT and actually give some meaningful support to it. This motion is called Early Day Motion 1122. 2018 is the 50th anniversary of this treaty – which was a milestone in international attempts to rid the world of nuclear weapons. You can find your MP’s contact details here. Scottish CND understand how important these talks in Geneva are to the future of the Non-Proliferation Treaty and ask all members and supporters to contact their MP over the next few days. This could be by email, text, telephone or even Twitter, ask them to support and put their name to Early Day Motion 1122. Download the Stop the War Petition ‘No more attacks on Syria’ and take it round your friends, workmates fellow students etc. AND COME TO THE MEETING ON THE 26th. The Edinburgh CND supported May Day march and rally will take place on Saturday 5th May. Assemble (top of) Johnston Terrace 11.30 for 12 noon. March behind the Edinburgh CND banner and join us for the rally in the Pleasance Theatre from 12.30. Our next organising meeting will be before this: Tuesday 1st May: ECND regular organising meeting, 6pm, Peace and Justice Centre, 5 Upper Bow, Edinburgh. 1.UNFOLD ZERO, the Basel Peace Office, International Peace Bureau, PNND, World Future Council and other international organizations have launched the new online platform Move the Nuclear Weapons Money. The platform is part of a global campaign to: cut nuclear weapons budgets; encourage divestment from companies manufacturing nuclear weapons and their delivery systems; reallocate these budgets and investments to meet economic, social and environmental need – such as ending poverty, protecting the climate, supporting renewable energy, creating jobs, and providing adequate healthcare, housing and education for all. Help count the nuclear weapons money: Join campaigners between May 10-16 as they count ($100 million per minute, $6 billion per hour, $146 billion per day for seven days). While counting they will highlight economic, social and environmental areas in which this money could instead be invested. Already they have parliamentarians, civil society leaders, artists, sports stars, musicians, activists, religious leaders, youth, war veterans and others signed up to count the money for 20-30 minutes each. Click here to sign-up as a money counter. Move the Nuclear Weapons Money held a press conference at the United Nations on March 28, 2018 to launch our new online platform and announce Count the Nuclear Weapons Money. At the press conference they also promoted the UN High-Level Conference on Nuclear Disarmament and released an open letter to the leaders of USA, South Korea and North Korea signed by more than 100 US civil society groups expressing support for the upcoming inter-Korean summit in April and the US-DPRK summit in May. 1.A) Peace campaigners from the United States and around the world are joining forces to encourage candidates in the US mid-term elections to commit to nuclear disarmament, improved firearms regulation, climate protection, international diplomacy and the cutting of military budgets to release resources for areas of human and environmental need. 2. The next ICAN Scottish Roundtable will be Wednesday, 30 May at 7.00pm. The Scottish ICAN partners and their friends will be hosted by UN House Scotland. To learn more about our work, please see our website at www.unhscotland.org.uk. One of the things discussed will be Scottish CND’s “Nae Nukes” peace rally on 22 September 2018 at Faslane nuclear base in support of the TPNW. More information is available on our Scottish ICAN website, nuclearban.scot or from SCND. Also on nuclearban.scot, there is news and a PDF to download about parliamentary lobbying; our recent letter from ICAN partners across the UK to the Secretary of State about the upcoming negotiations in Geneva on the Non-Proliferation Treaty will be going up sometime today as well. 4. STOP PRESS: UNFOLD ZERO understands that a decision will be made at the United Nations tomorrow (25th) to postpone the UN High Level Conference on Nuclear Disarmament which was scheduled to take place in New York from May 14-16, 2018.New dates for the conference have not been set. The Non-Aligned Movement, which initiated the proposal for a UN High-Level Conference, is continuing consultations with UN member States in order to find a suitable date.